Interloper I bought this computer via a discount from Best Buy, where I was working at the time. The Acer was the most unusually designed computer I had ever owned. It had a purely plastic case that opened like a clamshell. Needless to say that the upgrade options were "limited". During this time period I tried many different operating systems. This system came with Windows for Workgroups. I installed at one time or another: OS/2, Deskview, Windows NT 3.1, and even a beta of Windows 95. In fact, it still had the beta of Windows 95 when it was sold. When I first got Interloper, I was ecstatic about the speed of the Pentium CPU. Finally I could play games like DOOM, and Under a Killing Moon with no hint of speed loss. 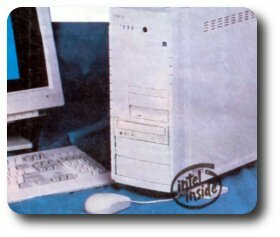 The Pentium 60 was a huge jump from the old 486sx/25. It was also during this time period that the infamous floating point unit (FPU) bug/flaw was discovered in the Pentium CPU. I did get mine exchanged from Intel. Though, the bug never really effected anything I did.